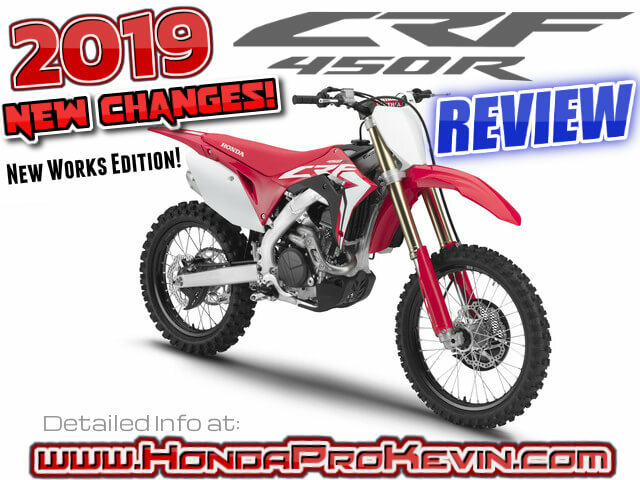 2019 Honda CRF450R Review of Specs / R&D + NEW Changes + WORKS Edition! 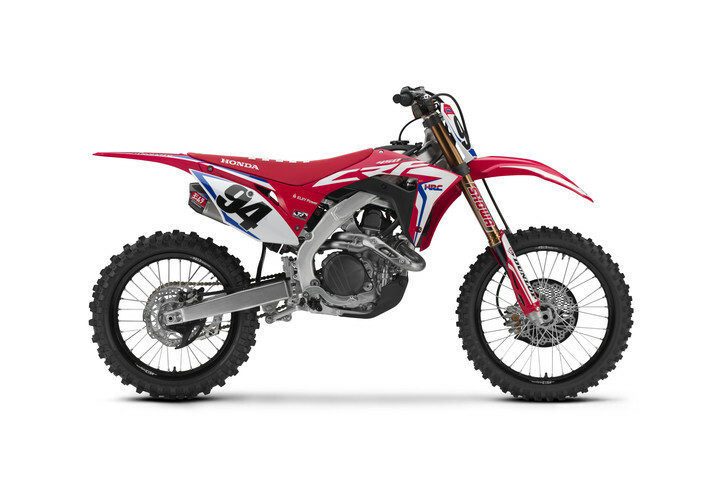 2019 CRF450R VS 2018 CRF450R Changes: Yes, I break down the details more in-depth below but here is a quick highlight – The CRF450R receives a major boost of top-end power and torque, and improved performance throughout the rev-range; it also gets 3-level HRC Launch Control plus durability-focused upgrades. 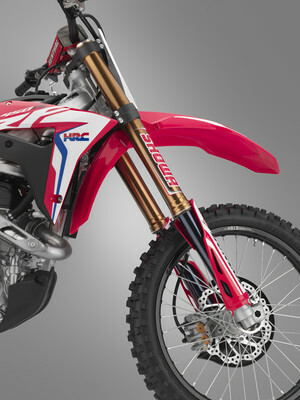 The chassis features revised suspension settings, detailed weight-saving updates and a new Renthal Fatbar handlebar. 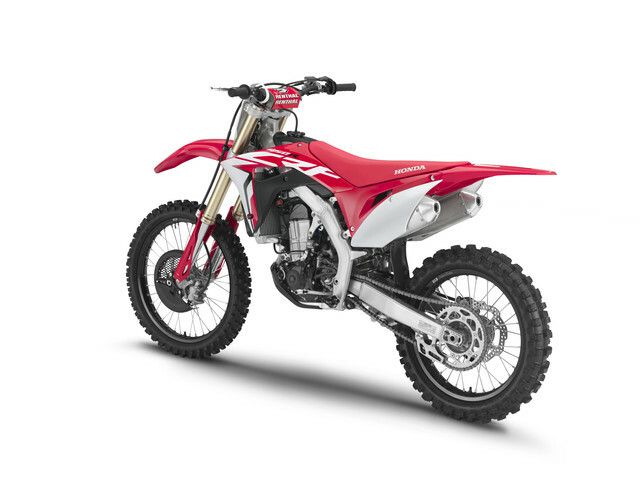 The Honda CRF450R has been the moto-crosser to beat since its introduction 2002. 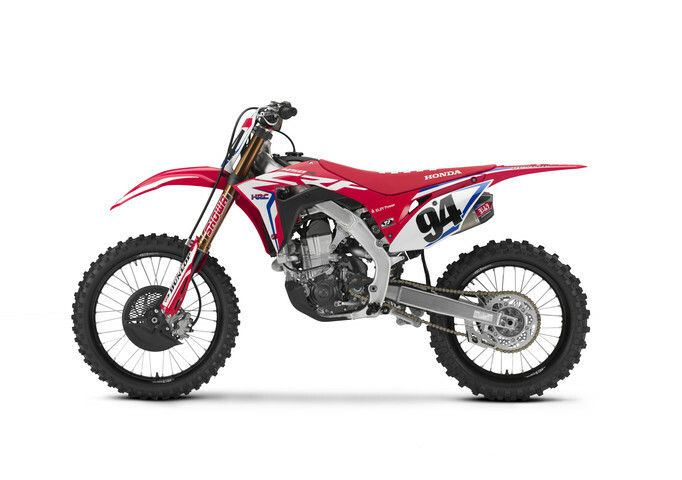 It has become a byword for balance and agility, and as such has always offered its rider – whether amateur enthusiast or pro-racer – total control and the chance to get the very best from their ability, plus the durability and longevity that Honda has long been famed for. 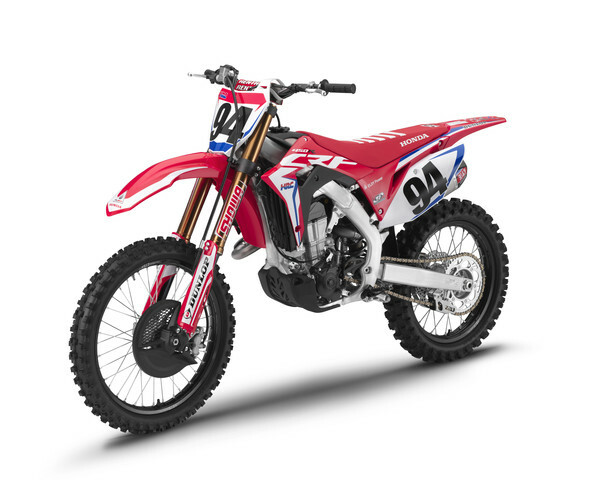 And of course the CRF450R has constantly evolved, with every upgrade, large or small, drawing on lessons fed back from Honda’s moto-cross racing programs throughout the world. For 2017 revolution replaced evolution. 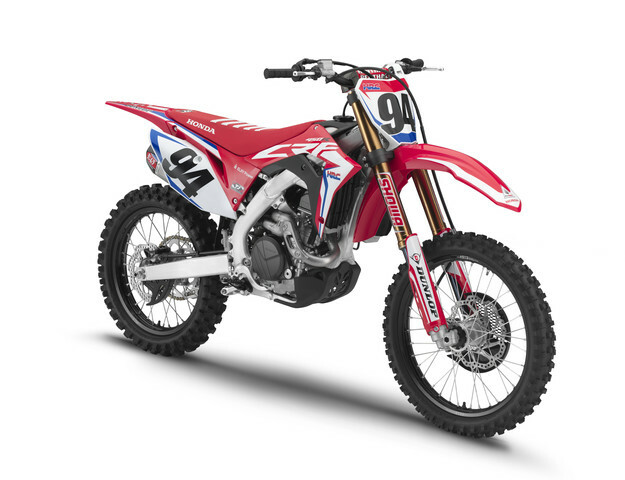 Under a total redesign headlined ‘ABSOLUTE HOLESHOT!” The world’s favorite open-class moto-crosser was effectively a brand-new machine, wielding a major power boost from a brand-new engine, plus increased grip and drive from a completely redesigned chassis. 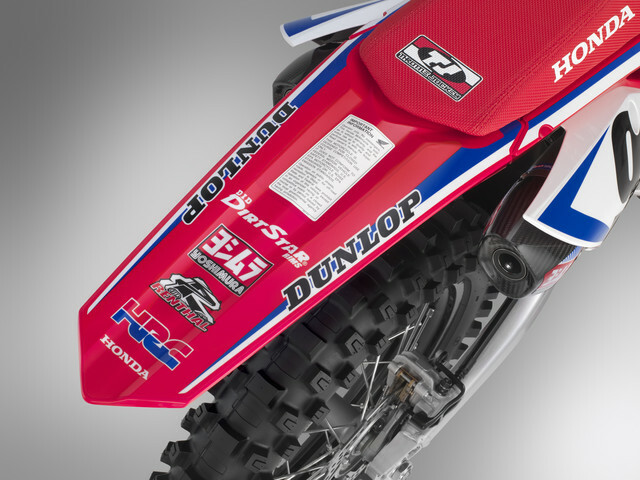 It looked different from the CRF450Rs that had gone before, felt different and delivered a whole new experience on track. 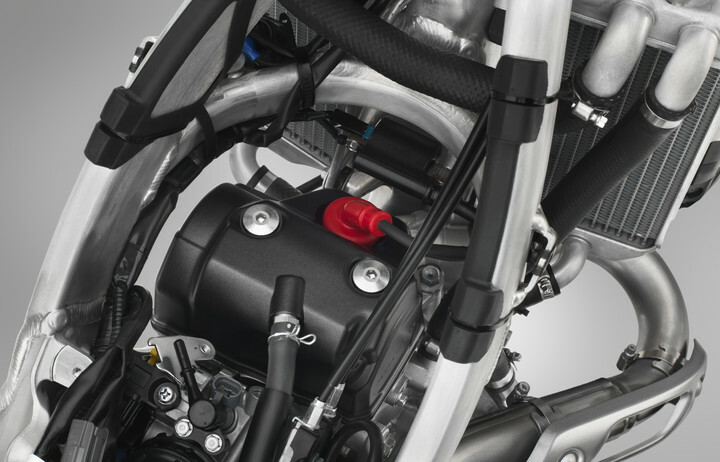 In 2018 the addition of standard-fit electric start (an option for 2017) completed the package. 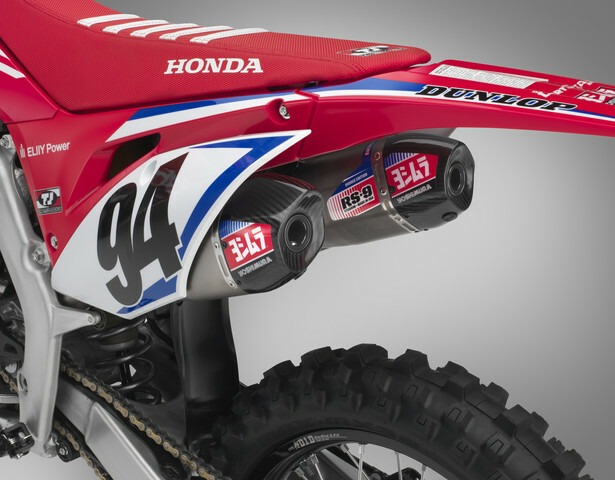 But the relentless demands of motocross competition mean that, year by year, even the best bikes have to get better, and for 2019, the CRF450R is getting a straight shot of HRC works technology with major upgrades that make it faster still. 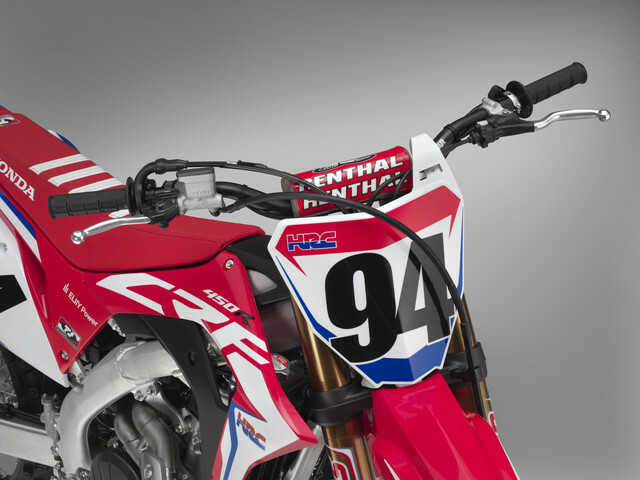 The ability to punch out of the gate first and build blistering lap times is what the CRF450R has been all about for the last two years. 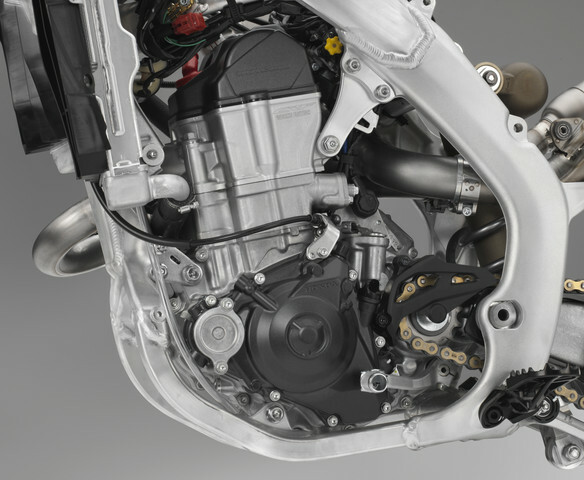 And for 19YM performance rises yet again; considerably more power and torque has been extracted from the engine – via HRC-led tuning of the cylinder head, intake and exhaust – without sacrificing low-RPM tractability. 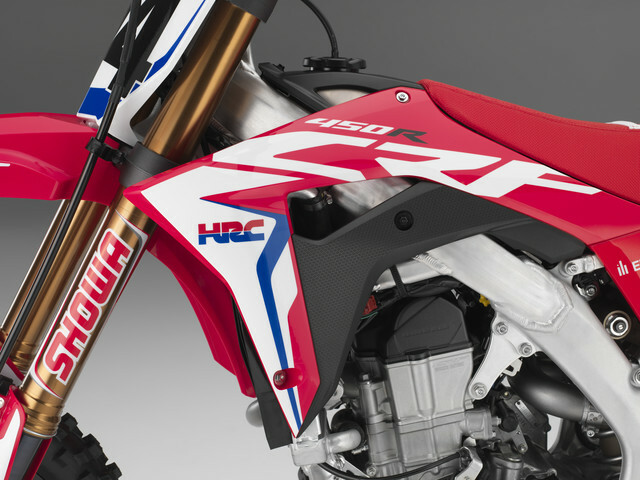 3-mode HRC Launch Control is an addition, helping any rider from beginner to expert hit the mark from the starting gate every time. 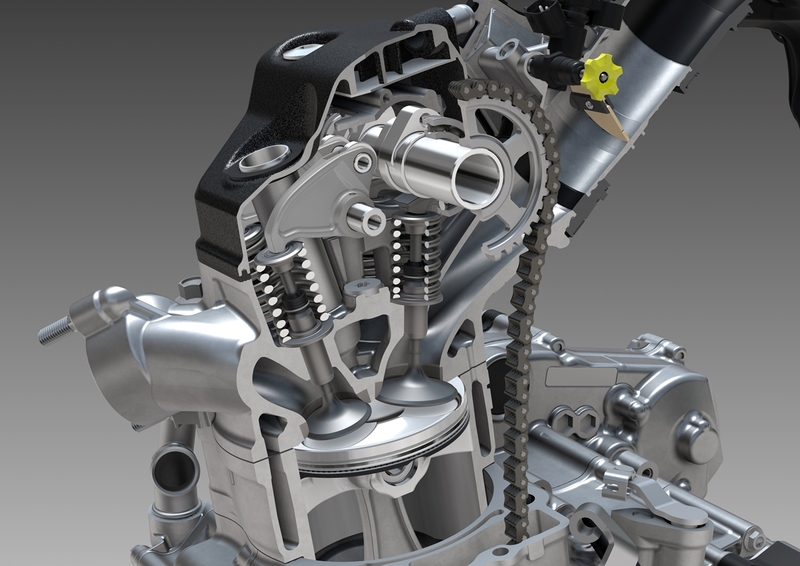 A shift sensor enables the use of specific ignition maps for each gear, and PGM-FI has been optimized to inject twice per cycle. 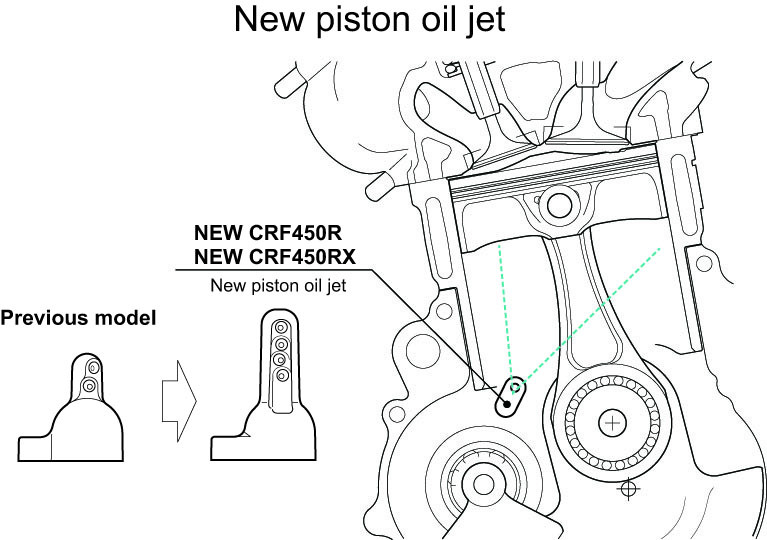 Oil pump capacity has been uprated, and the clutch lifter and pressure plate redesigned. 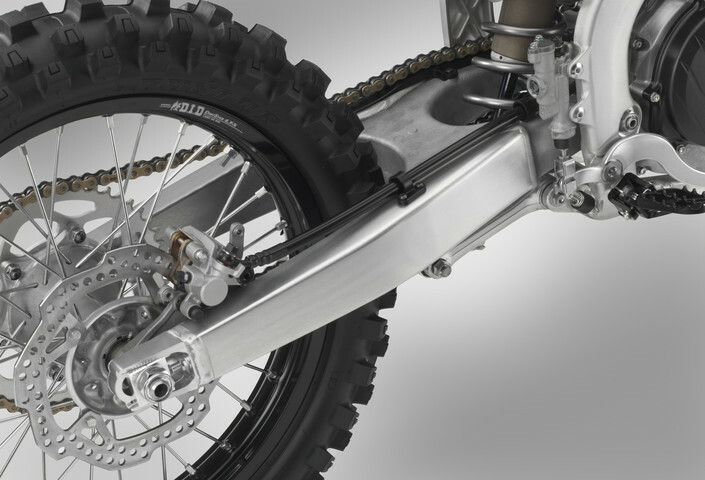 The aluminum twin-spar frame is essentially unchanged but made slightly lighter, as has the swingarm. 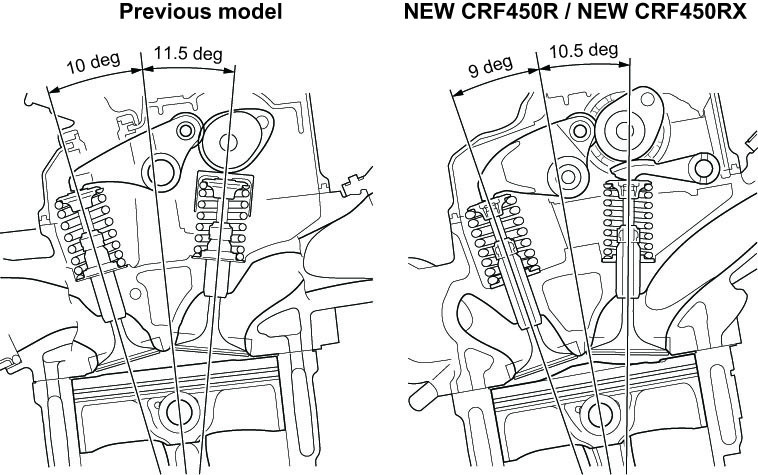 A new front brake caliper also shaves more vital grams. 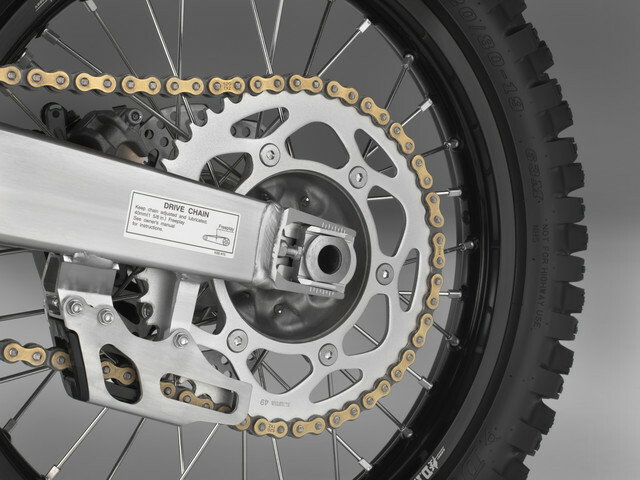 Revised oil and spring/damping settings for the 49mm Showa USD fork enhance reaction, complemented by a ‘Super Finish’ process for the rear shock’s damper, plus revised Pro-Link ratio. 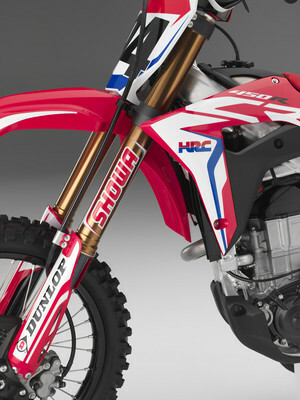 New Renthal tapered handlebars can also now be adjusted forward/back on the top yoke. 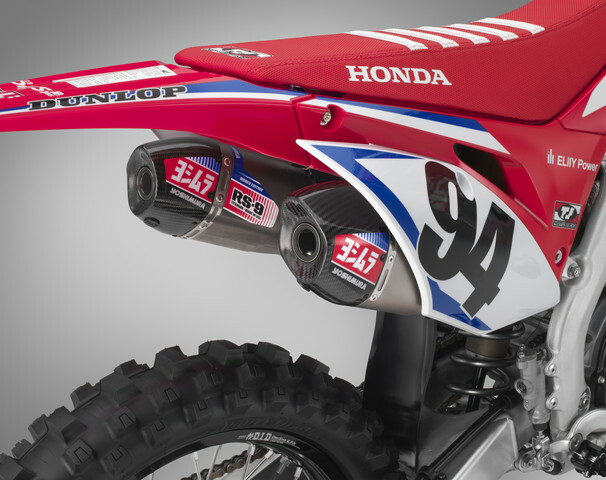 Homologated for racing and available in limited numbers, the CRF450RWE Works Edition includes all the improvements of this year’s CRF450R plus a special hand-ported cylinder head, black DID LT-X rims, an exclusive Yoshimura muffler, titanium nitride-coated lower fork legs and shock shaft, an RK gold chain, special ECU settings, black triple clamps, revalved suspension, a factory-spec gripper seat, and an HRC decal package. 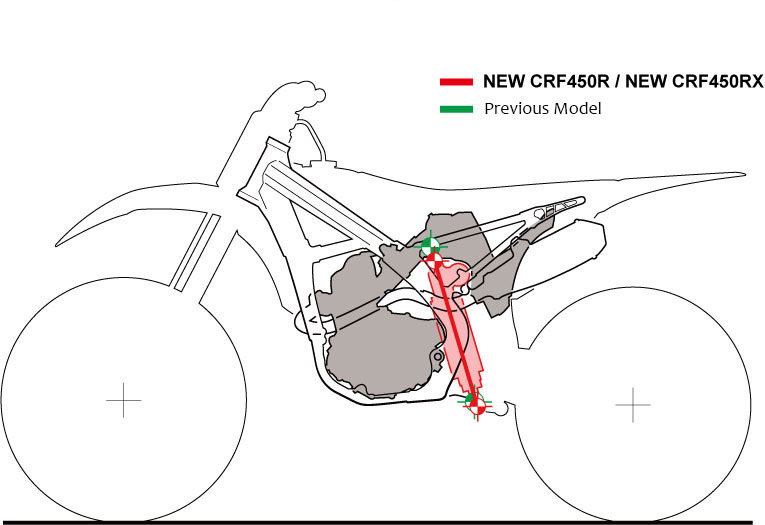 Check out more detailed pictures and information on the 2019 CRF450R Works Edition (CRF450RWE) below. 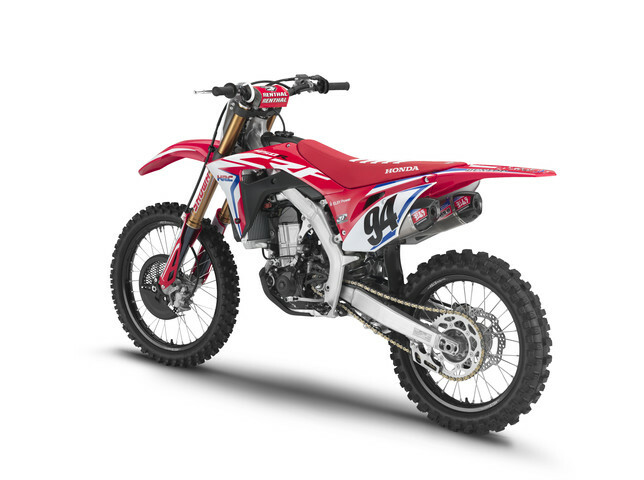 Utilizing the space gained by eliminating the kick starter, a new exhaust features a larger pipe diameter and optimized design at the branching location for increased power. 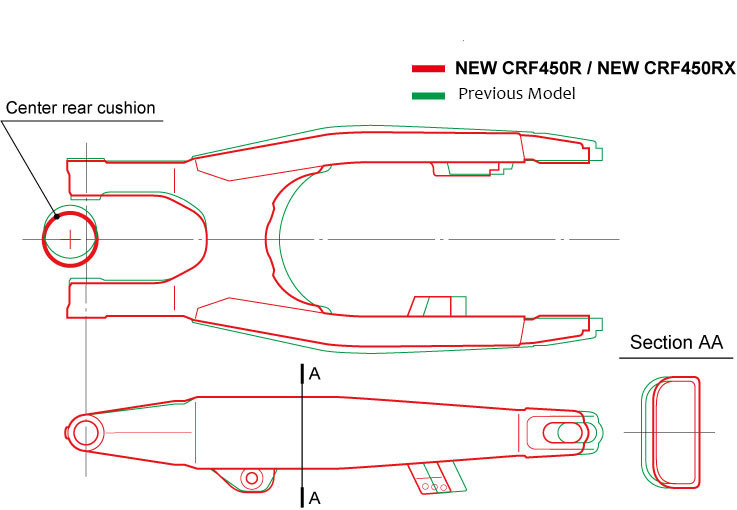 Previously 31.8mm, the right and left pipes are now 35mm and 43mm, respectively. 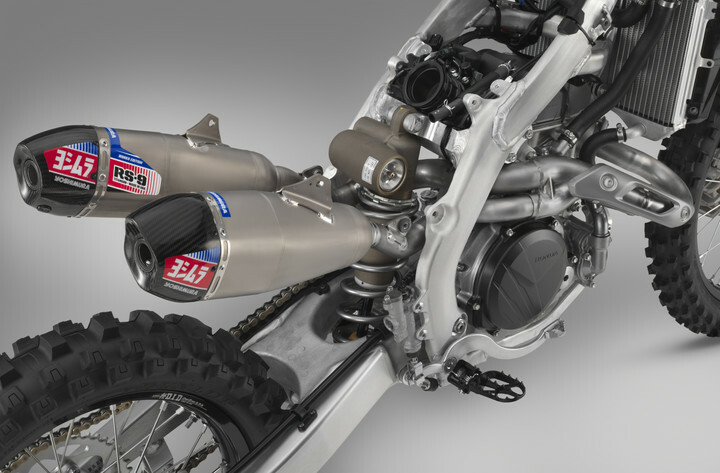 In addition, total tube length (from exhaust port to muffler end) is up 98mm on the right and 187mm on the left. 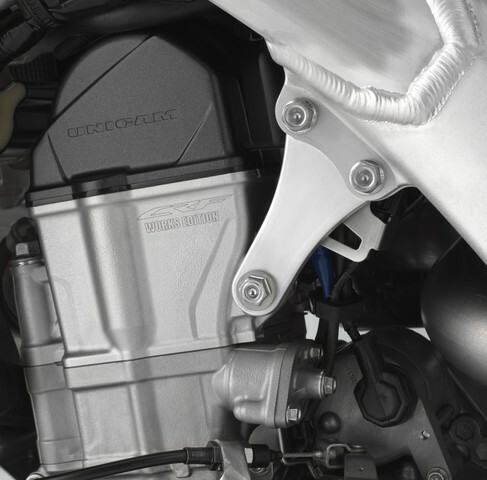 While the architecture of the 449cc four-valve Unicam engine remains essentially unchanged – apart from removal of the kick start – a host of detail changes deliver the increase in power and torque. 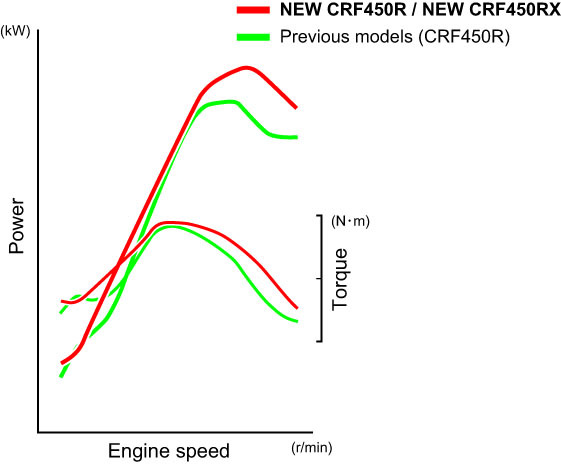 And while the peak boost is significant – 2 more horsepower at 9,500 RPM and 1.48 more in the torque department at 7,500 RPM – it has not been achieved at the expense of low-down performance: the strength of the 2019 CRF450R engine’s power and torque curves from 3,000 RPM up are well above the previous design, and corner-to-corner over-rev has also been enhanced. 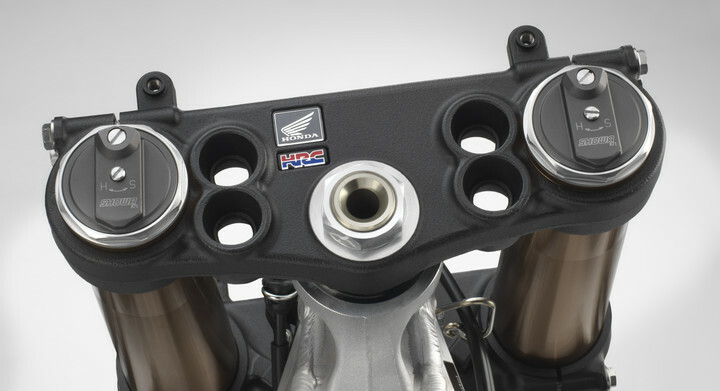 Bore and stroke remains 96mm x 62.1mm with compression ratio of 13.5:1. 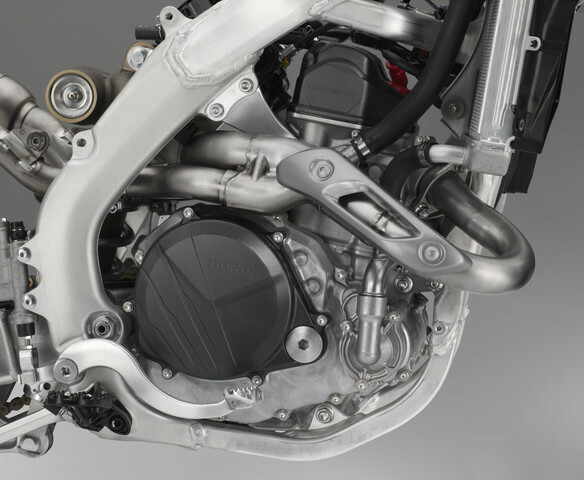 Combustion chamber squish has been revised, as has the piston skirt profile, piston ring and conrod; both right and left engine cases have been optimized for strength versus weight. 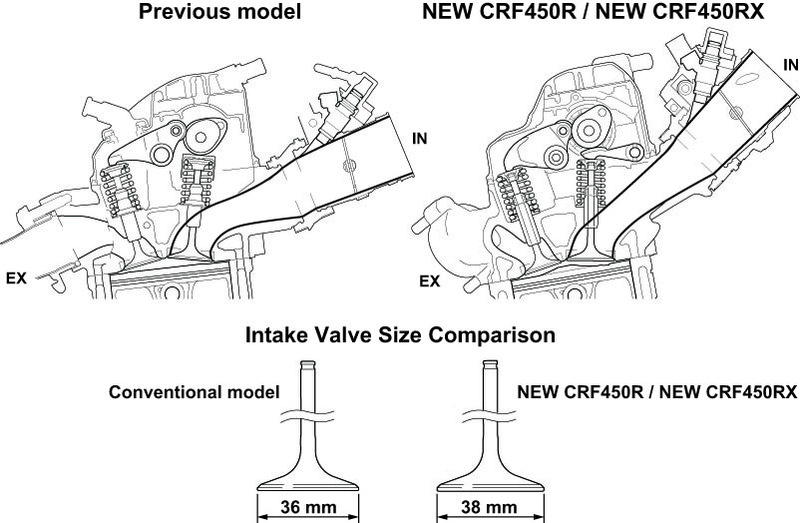 A new air cleaner element base has more than double the surface area, and flows much more air as a result; revised PGM-F1 settings make use of the improved air flow, and the system now injects fuel twice per cycle. In step with the improved engine output, a revised radiator grill improves air flow for maximum radiator efficiency. 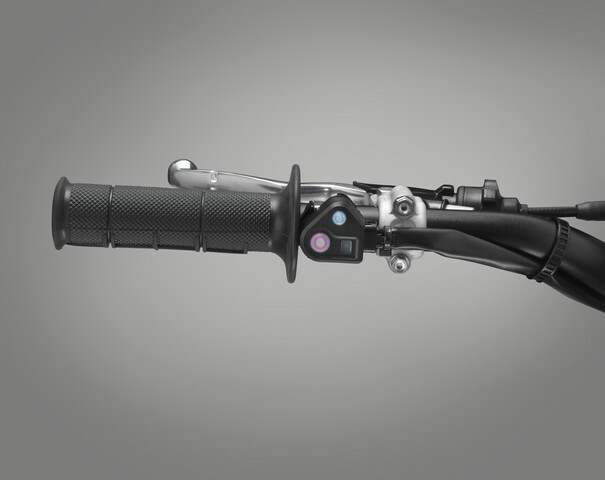 A gear position sensor allows the use of three specific ignition maps for 1st and 2nd, 3rd and 4th, and 5th. The exhaust too now uses differing, larger diameter bores where it splits from the downpipe; 35mm right and 42mm diameter left (both were 31.8mm before). 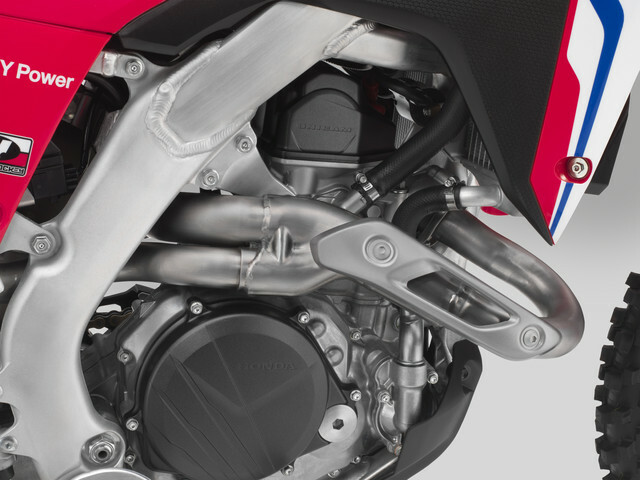 And the total length of the left side exhaust – from port to tip – has been increased 187mm, with the right muffler tube 98mm longer. It’s not all about performance. 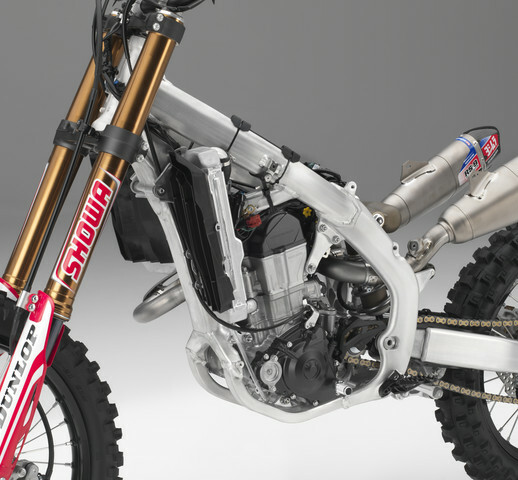 Rock-solid reliability has always been a big factor in the CRF450R’s success. A new 5-hole piston oil jet replaces the 4-hole design and the scavenge pump, which used a single, 16mm diameter pickup drum now employs twin 12mm drums, resulting in greater capacity. 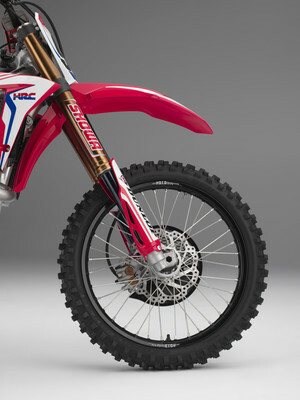 The clutch lifter and pressure plate are redesigned for improved durability. Final drive is via 13T front and a re-shaped, lighter 49T rear sprocket. 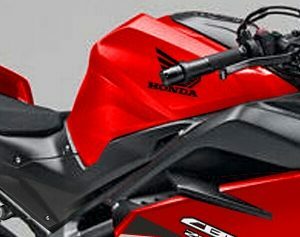 Honda’s EMSB (Engine Mode Select Button) puts instant engine character adaptability at the rider’s control. With the machine stopped, and engine at idle, a simple press and hold of the button for just under a second selects the next map in sequence. The LED built into the button signals the map in use with a quick press and number of subsequent flashes (like HRC Launch Control, 1 flash for Mode 1, etc). 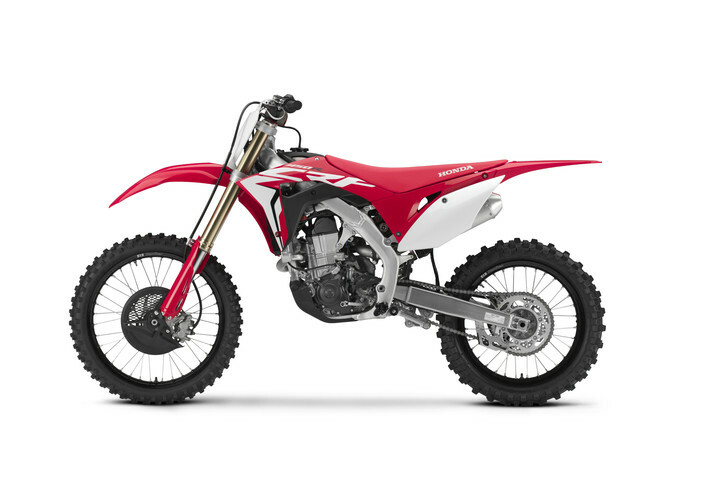 If a new map is selected the choice is also confirmed to the rider. 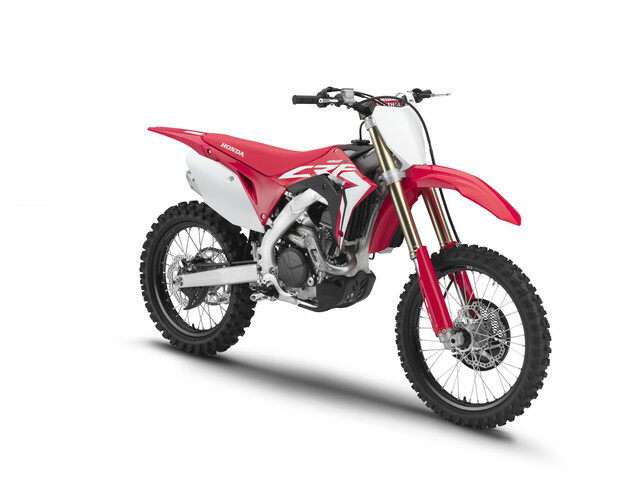 The goal for the seventh generation of CRF aluminum beam frame, debuted in 2017 were clear and defined: improved cornering performance and front-end stability/traction – plus rear wheel drive – while delivering elevated levels of rider feedback and predictability. 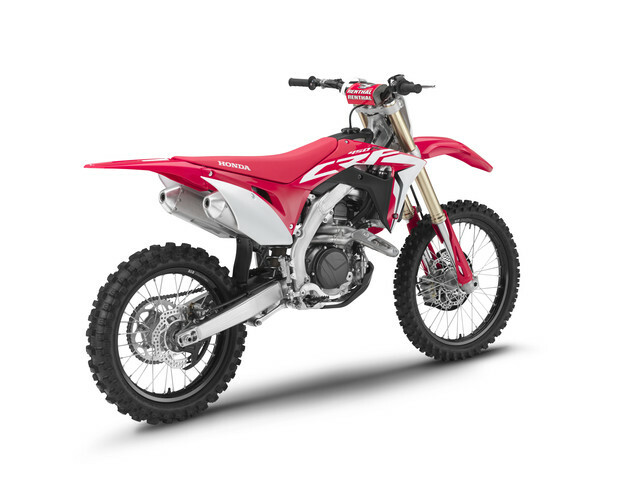 And if the focus of YM19 revolves around more power (and its control) from the engine, the CRF450R’s chassis has also improved in step, with even better balance, turning ability and tracking through a corner. 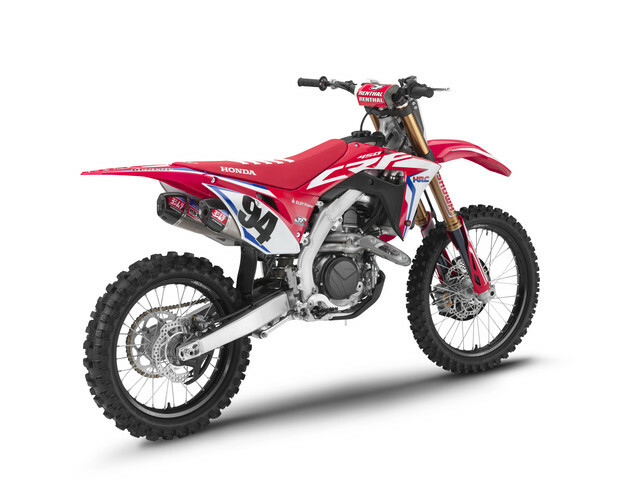 Honda shaved off 1.98 lbs (0.9kg) of weight from the 2019 CRF450R dipping its dry weight down to 237 lbs (107.6kg) and a wet curb weight of 247 lbs (112.3kg) while suspension action front and rear has been revised. 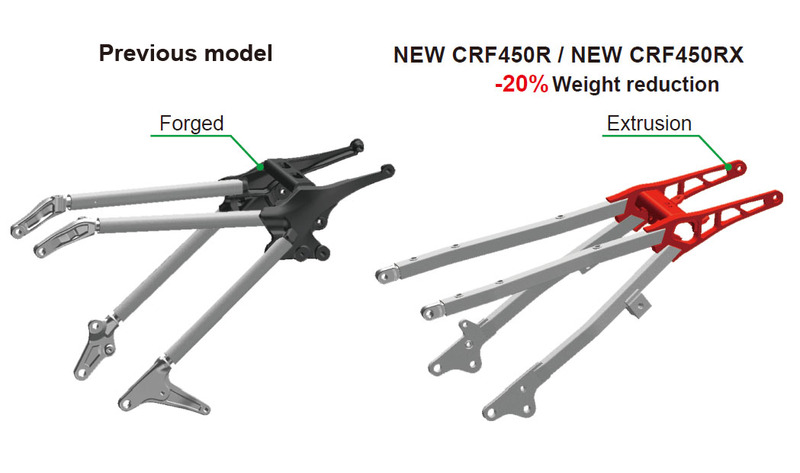 Rake and trail are set at 27.4°/116mm, with wheelbase of 58.4 in. (1482mm). 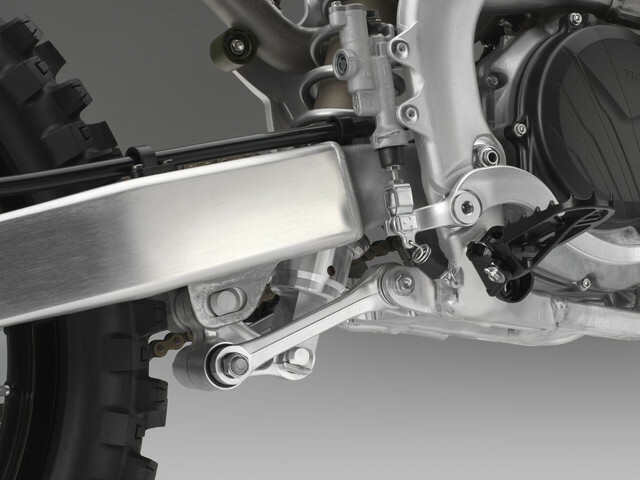 The tapered twin-spar frame design has been slimmed and lightened around the swingarm pivot plates – the swingarm, too has been subtly re-shaped, is lighter and features a lower rigidity balance to improve traction and feel. 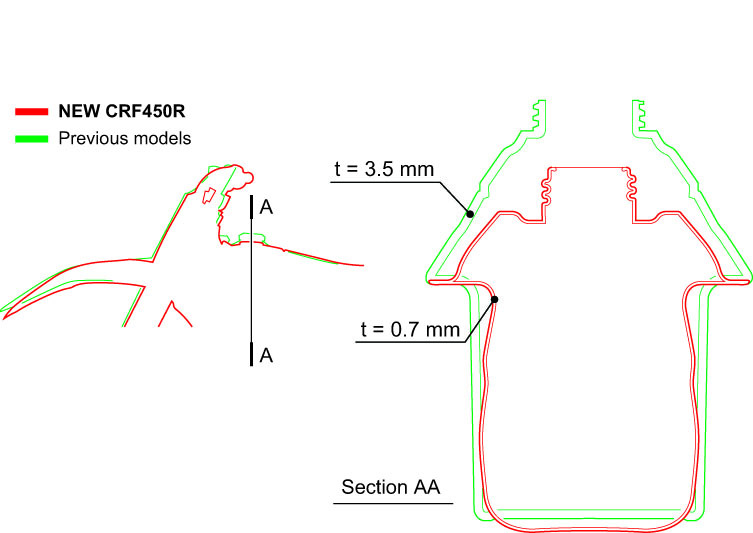 The rigidity of the right and left cylinder head hangers has also been optimized. 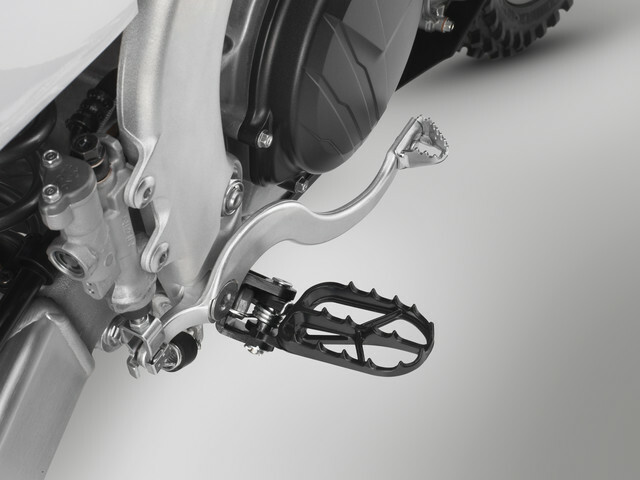 A tiny detail – that also saves 20% weight – are the footpegs, which now use a 4-web (rather than 6) internal structure to clear mud. 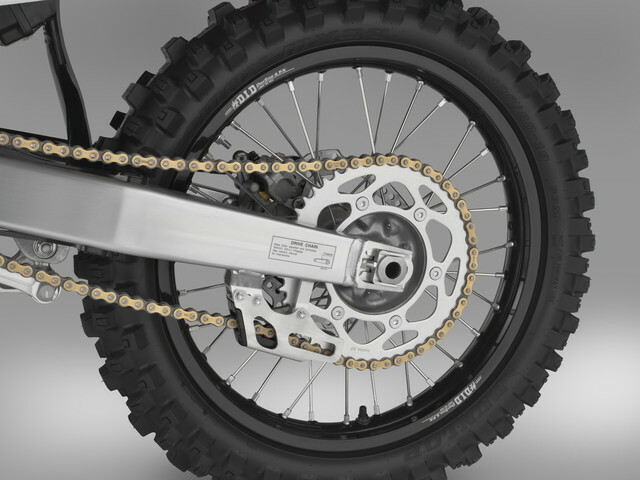 The fully adjustable 49mm Showa USD coil spring fork is a version of the Showa ‘factory’ fork supplied to MX race teams around the world. 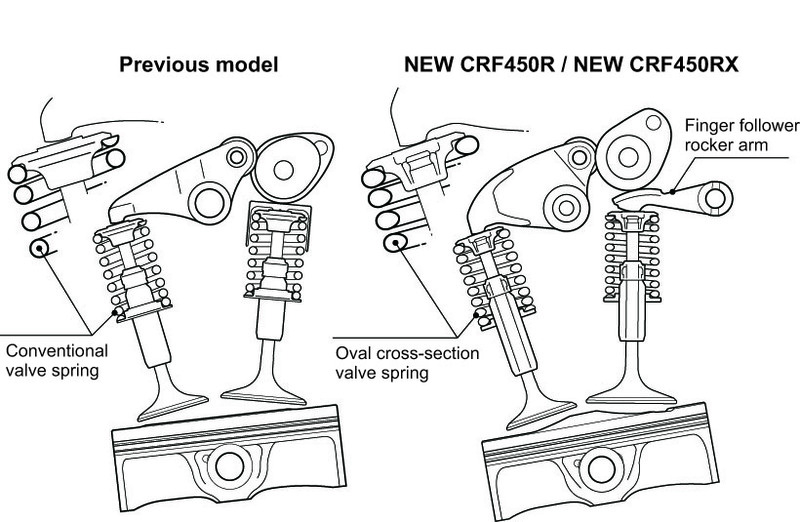 For 2019, spring rate, compression/damping settings and oil weight have been revised. 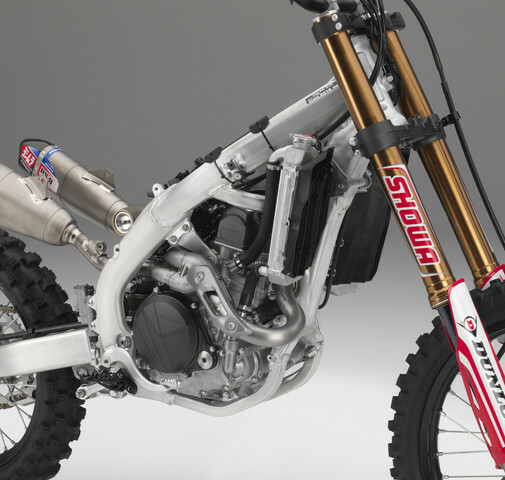 The fully adjustable Showa rear shock has received a ‘Super Finish’ treatment, which improves its stroke action. 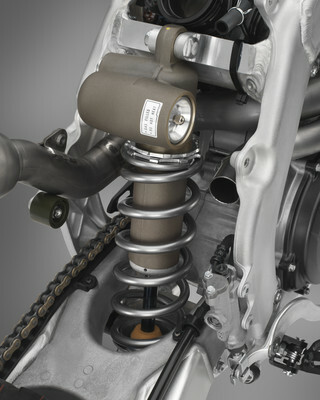 A revised Pro-Link ratio softens slightly as it reaches full compression. 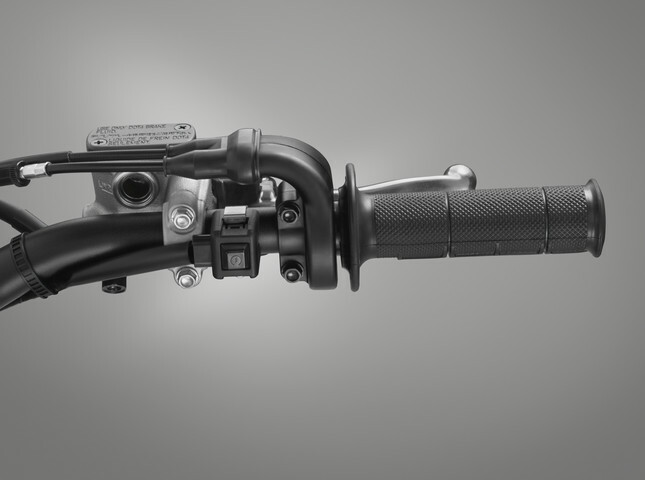 The new Renthal Fatbar reduces the weight of the steering system and flexes for optimal comfort; the top yoke features two handlebar-holder locations for moving the handlebar rearward and forward by 26mm. 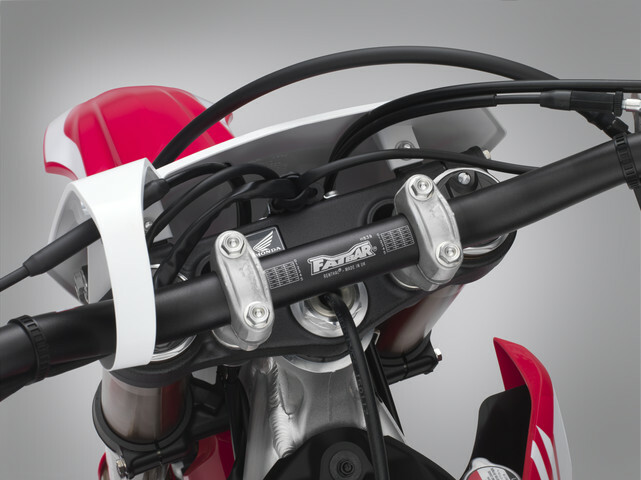 When the holder is turned 180 degrees, the handlebar can be moved an additional 10mm from the base position, resulting in four total unique riding positions. A Bar Pad is also included. 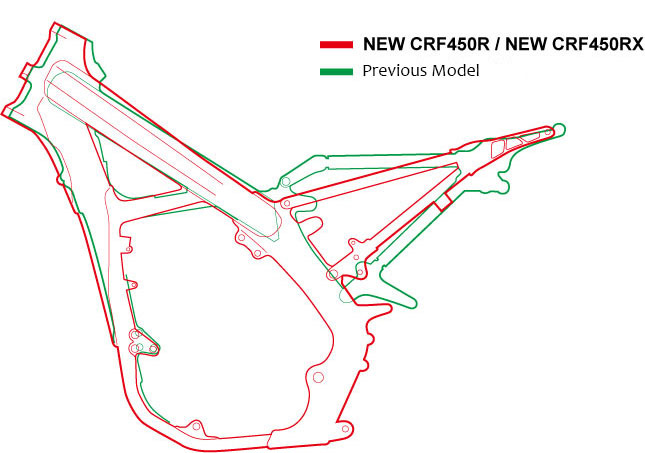 A new twin-piston front brake caliper uses 30 and 27mm diameter pistons (the previous design used 2 x 27mm pistons). 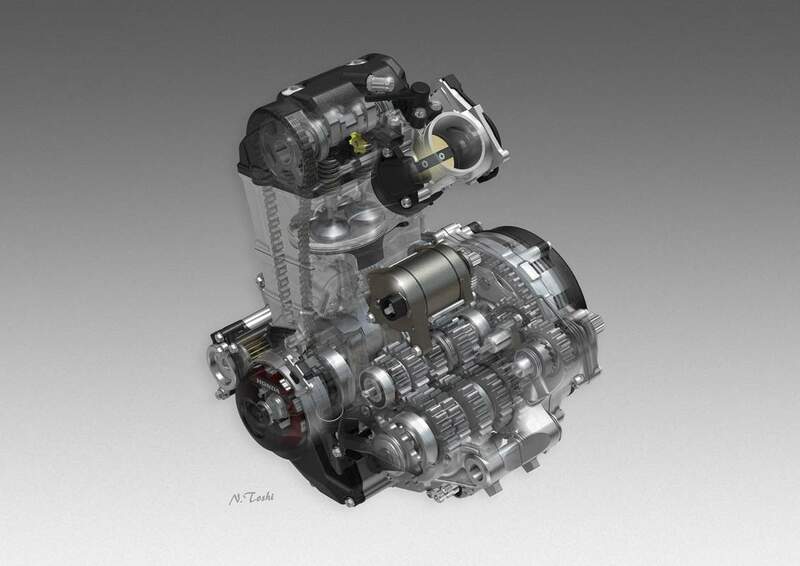 This allows for a lighter body and, along with low expansion-rate brake hose, improves brake feel and power. 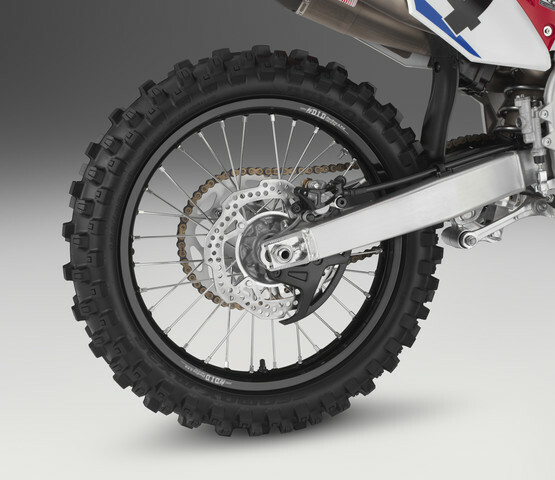 It works on a 260mm wave-pattern disc, matched by a rear 240mm wave-pattern disc and single-piston caliper. Lightweight DID aluminum rims, with directly attached spoke pattern layout are now finished in black; the front is a 21 x 1.6 in, the rear a 19 x 2.15 in. 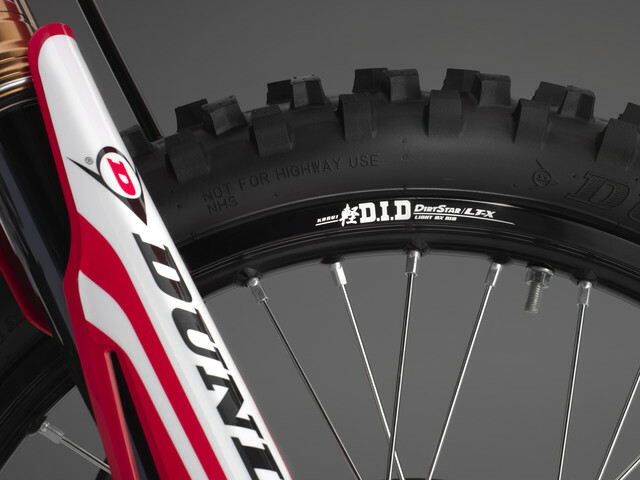 Fitted as standard equipment are Dunlop’s MX3SF and MX3S soft terrain tires. 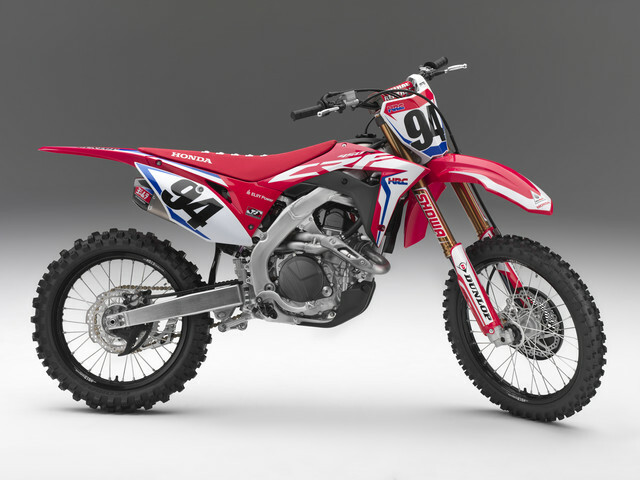 The CRF450R uses a lightweight 1.66 gal. 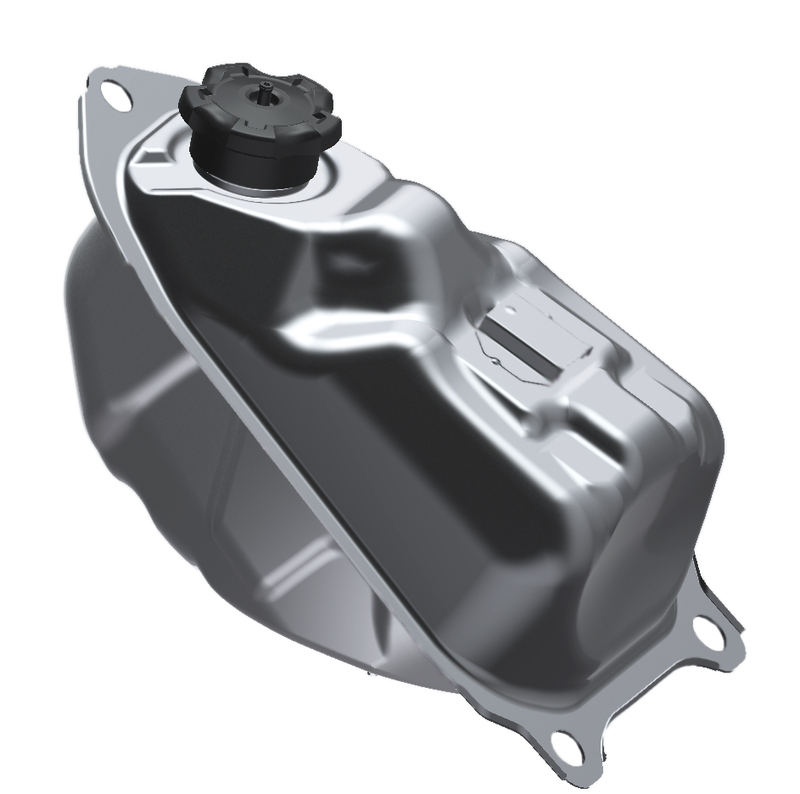 (6.3L) titanium fuel tank. 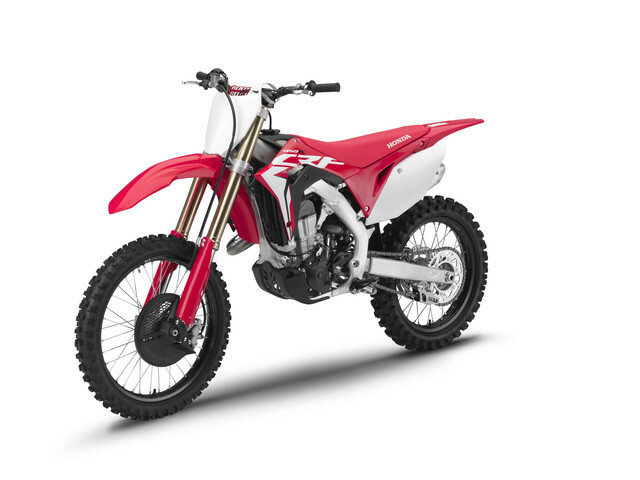 The smooth external lines of the plastics help the rider move easily, and the narrow frontal area and front mudguard directs an efficient funnel of air to the radiator – for 2019 the radiator grills have been redesigned to flow more air. 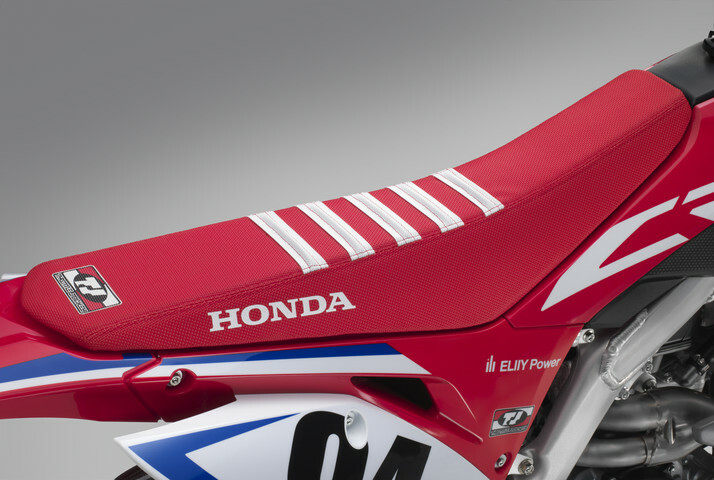 The bodywork uses durable film inset graphics that cover a wide area with scratch-resistant style. 4. 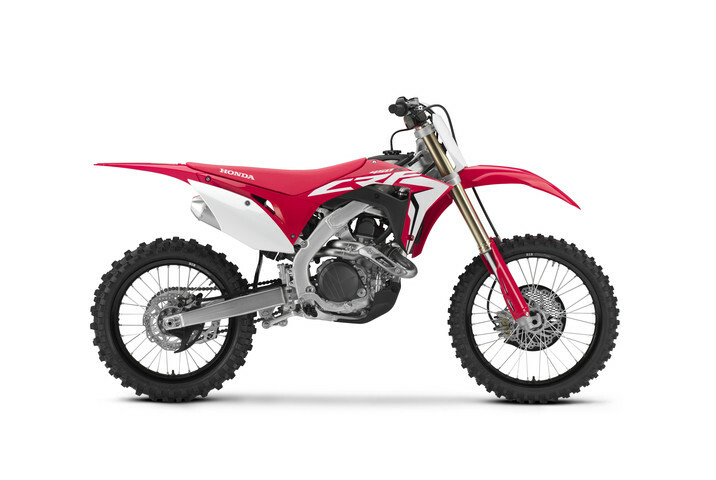 | CRF450RWE Details | What’s Different?